Yesterday we threw away two perfectly good heaters because we can’t use them in our new apartment. We also can’t sell tor even give them away, and it’s hard to shake the feeling that it was somehow planned to be this way. The heaters are made and sold by Tokyo Gas. Unlike standard gas heaters, which directly convert “city gas” piped into your home into heat, these draw hot water from your boiler (or, to use the redundant Americanism “hot water heater”). In that way they function in much the same way that baseboard heating does, except for one very significant difference. Baseboard heating is built into a house or apartment, and is generally designed in such a way that it doesn’t get in the way. These water heaters, on the other hand, are stand-alone boxes that do get in the way since they connect to wall outlets via thick hoses. Ideally, Tokyo Gas wants you to buy one for every room in your apartment, and priced at between ¥28,000 and ¥45,000, they can add up to quite an investment. This wouldn’t be that much of a problem if the system of remote hot water heating were widespread, but it isn’t. In fact, it seems to have been the fashion during a very brief window of innovation around the turn of the millennium, which is when we moved into our apartment in a new semi-public UR building. At that time quite a few UR buildings adopted this heating system, so if you wanted to heat these apartments you had three options: this system, electric-based “aircons,” or electric space heaters. Most UR buildings ban kerosene heaters (which doesn’t mean people don’t use them in UR buildings; during our eleven years here we saw a number of people boldly carrying containers of kerosene up in the elevator), and electric heating is notoriously expensive, so people shelled out the money for these water heaters. That window is now shut. Sometime in the early 00s, UR started putting floor heating into their new buildings, and from all of my research it appears the hot water heating system has gone the way of the mini-disc. It’s still used in this buidling, as well as other UR buildings in Tokyo, but UR and Tokyo Gas don’t encourage the recycling of these boxy heating units. When we told our building management that we were moving, they asked if we had put screens in the windows (the apartments didn’t come with screens, so we had to have our custom made–about ¥100,000 altogether, since our apartment has a lot of windows) and they said we could leave them. Though they didn’t offer to reimburse us for them, we were glad since it would save us the trouble of breaking them down and throwing them away. But when we asked if they would also take our water heaters they said “no.” Do they have a system where new tenants who will probably want to buy these units can take them off our hands? No. Is there a bulletin board where we can offer them for free to anyone? All postings have to be approved by the building management, and you can’t use bulletin boards to sell merchandise. But we’re giving them away. No response. So that means we have to throw them away, and pay for the privilege (¥600 each). The stupidity of this system is easy to explain. Tokyo Gas and UR have a thing going. Obviously, TG doesn’t make money if present tenants sell their heaters to future ones. What’s particularly bizarre is that Tokyo Gas still has to manufacture these units even though they don’t use this water system any more. Usually when you talk to housing professionals about Japan’s stubborn refusal to recognize central heating for residences, you’re told that it’s more “efficient” to heat each individual room, which makes sense only in theory. In practice, what you get is lots of “devices” that have to be trashed sooner rather than later. The whole air conditioner market is built on this business model of “things” that have to be “updated” every few years. Here in NYC, the gas utility company would definitely have done a massive gas leak check and found that pipes needed to be reinstalled as they did for my building when there was a fire on the ground floor. An earthquake would have caused much more damage than a ground floor fire. It seems to me that this practice of not providing anything even heaters speaks to a suspicious mind circumventing the eventuality that a bad tenant will destroy or steal provided heaters. I don’t know about the old apartment, but when the Tokyo Gas guy (see following post) came to hook up our new stove he checked for gas leaks. Of course, landlords are suspicious by nature, and surely they don’t want to have to replace appliances with every new tenant. But as we mention in these two posts, the main reason UR doesn’t always provide heaters is its relationship with Tokyo Gas, which depends a great deal on the rental market for sales. We used one of the plug-in hot-water heaters that connects to the gas central heating system for a very short time about 20 years ago. It was incredibly expensive to buy — about 40,000 yen, I think — and the gas bill was extremely high. It was so noisy that it was impossible to listen to TV or make a phone call. If you use the equivalent of 3kW of gas heating, then that’s what you’ll pay for — 3kW worth of gas. 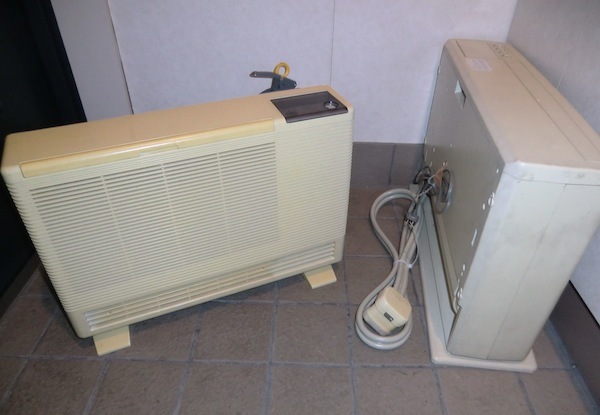 Air conditioners, on the other hand, are heat pumps; modern Japanese “inverter” air conditioners use about 500W of electric power to pump 3kW of heat from inside to out (in summer) or from outside to inside (in winter). You are paying for 500W but getting 3kW! This is a much better deal. The expensive high-end models have reversible extractor fans that can be set to automatically draw in cool air from outside on summer evenings when the temperature outside is lower than that inside (then they don’t use the compressor at all, just the fan). I worked at an International school in Setagaya Tokyo for many years. Teachers come and go and experience the same expense when they move into their apartments. It would be wonderful if things were donated to these international schools for new teachers. It would save them bundles and soften the headaches of their housing experience. As a carpenter who works in Tokyo. The total lack of insulation is a scandal as if there was more insulation in homes heating bills would be reduced. I have worked on new homes here for major building firms and insulation is very limited I should know I have put it in. Where are the eco homes with low carbon footprints or carbon neutral homes.